Sometimes in our zeal to create the ideal, we forget that our kids are still young and can tire easily. We don’t have to do it all, to do it well. Here are a few things to keep in mind when your enthusiasm for learning creates cranky kids. 1. Remember the Brave Writer one-thing principle. Pick one thing that you want to do with your kids and only do that one. Prepare for it. Set it up to succeed. Enjoy it while it’s happening. Reminisce about how great it was. Do not pass go or collect new activities to attempt until you have happily followed all four steps. If you go on a nature walk, the idea isn’t to race through the hills tracking as many birds as possible. The idea is to walk at a pace that everyone can handle, stopping to examine a bug on the ground or to run fingers over moss or to eat granola bars. Look for birds and butterflies and chewing gum stuck to the bottom of the bench. Remember that the love of nature is cultivated by a positive experience in nature, not by a lengthy catalog of species observed or creatures sketched. The photo for today’s blog is an example of when to quit. When brilliant art is less interesting than snoozing on the bench in the middle of the room, you’ve already exceeded your child’s absorption limit. 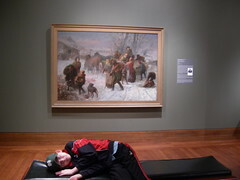 Viewing art with alert children for an hour is better than dragging them through the entire exhibit for four. Your money’s worth is not measured by time but by the exhillaration of the experience. Never expect your kids to be interested in what bores you. If you just don’t have enthusiasm for Shakespeare, don’t foist it on your kids. If you find poetry too puzzling, read novels. If you wish you did have interest in art, classical music, bread baking or Scrabble, pursue it for yourself, paying attention to how you overcome your resistance and initial fear/anxiety about the topic. Then, share your enthusiasm with your kids while modeling how to overcome the intimidation factor of that particular field. Some of the best homeschooling happens off-schedule. I used to make the mistake of thinking that it “didn’t count” if I hadn’t planned it in advance. Absurd. Years of home education have taught me that following the rabbit trail (Greek myths lead to looking up the Greek alphabet online to watching “Hercules” by Disney) , seizing the moment (reading four chapters while interest is strong rather than the usual two), scrapping the schedule (to accept an invitation to see newborn puppies) usually produce the highest quality memories and learning. Remember: joy is the best teacher. Tune into joy and you’ll be tuned into your kids and learning. This is so true, and such a nice reminder. Far too often over-planning can interfere with natural learning. Thanks! Thank you for the kind reminders and thoughts. It touched me and I had to share a link to this entry from my blog to yours. I hope many people read this and take it to heart. We left public school for home-schooling in part because my very deliberate, detail-oriented daughter felt rushed– at lunchtime, in art classes that lasted only 45 minutes, and, most memorably, during field trips. Once we were in a State Park, along with about 60 other children from her school. The students were divided into groups and a guide took us on a hurried nature walk. We could not hear what he was saying, and there was no time to stop and really look at anything. The last “stop” on the tour was a tree with an owl’s nest in it. My daughter pulled me closer and said “Can we come back and REALLY look at this sometime?” Returning to do it slowly became a common theme at subsequent field trips. I would also like to add that sometimes at museums or zoos we stay longer than we should because we want to “get our money’s worth”. I appreciate memberships to counter this reaction, because if you are having a day when you need to leave after an hour, you don’t feel like the money was wasted. Thanks again Julie. Once again, you have reaffirmed my choice to homeschool. There is such a thing as “Brave Mathematicians” – it’s called “Living Math” and is owned by another Julie. Thanks for this!! I also have the “get-it-all-done-today-or-we’ll-be-behind” disease. After reading Bravewriter the first time, I was all over it! I felt like the answer to my stress and worry over teaching writing and homeschool in general was finally answered. Well, wouldn’t you know it, a couple months later and what has happened to the connectedness, enjoyment and creativity? All of the fun stuff has fallen off the schedule and I am reverting to my old self again. Thanks for the reminder! I am printing this one!